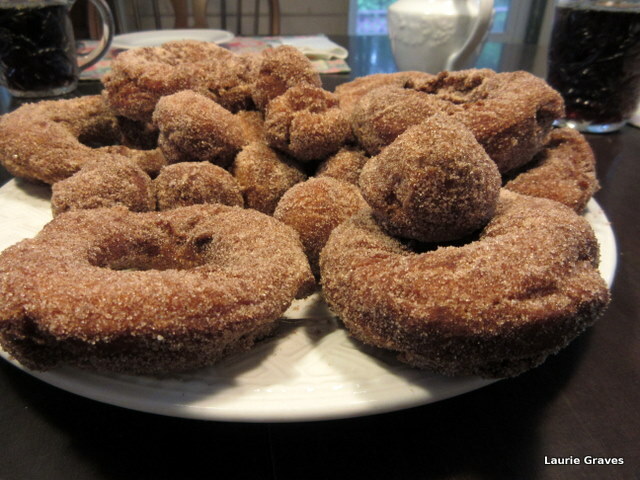 “All right,” Clif answered blithely, knowing as well I did that it had been a long, long time since we had made donuts and that we might be just a teensy weensy bit rusty. But one of the things I especially love about Clif is that he is always up for a cooking adventure, especially when it involves his deep fryer. Alice accepted the invitation, and the game was on. Alice is one of those friends that everyone should have. We are very good buddies, and I have known her long enough so that if there was a disaster with donuts, it would be all right. We would just laugh about it. Since Alice planned to come over around 11:30, I decided we should have a little lunch first, so I put together a platter of homemade chicken salad, which we gobbled up. Then, it was on to donuts, and while it wasn’t exactly a disaster, we did have a few difficulties, the first being that I didn’t read the directions thoroughly. I dumped all the flour in the bowl at once, and this made it difficult for my little hand mixer to mix the dough properly. But the biggest kerfuffle was that the dough was too sticky for the donut cutters, and the dough stuck stubbornly inside the cutters. Okay, more flour. Still too sticky. A little more flour. The donuts came out with a thump, but they were a weird shape. I tried doing this, and success! “What was your mother’s name?” I asked Alice. 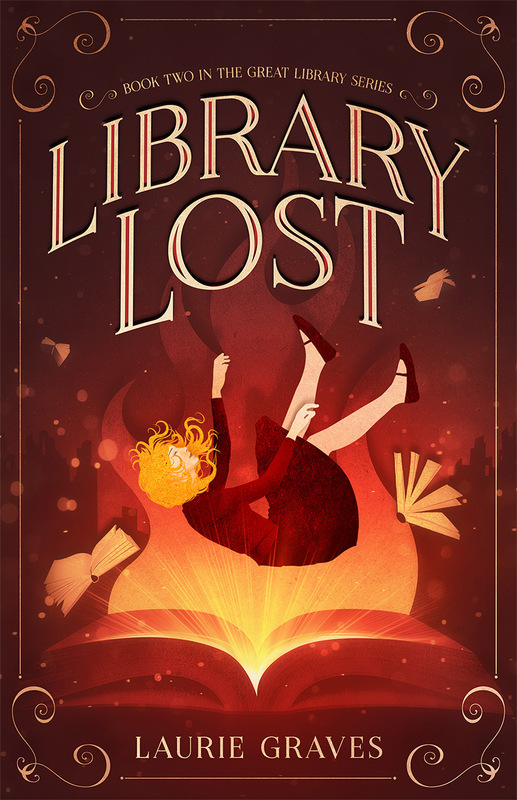 “Thank you, Dottie,” I said, smiling and looking upward. 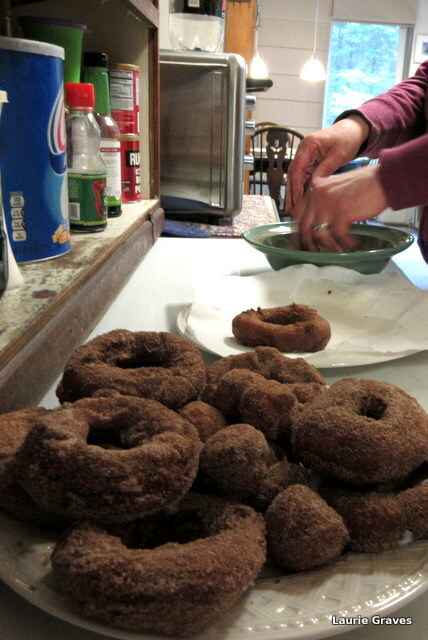 With a firmer dough and Dottie’s method, we were finally in donut-making business, with me cutting the donuts, Clif frying them, and Alice rolling them in sugar and cinnamon. When we were done, we had two fine plates of donuts, and we settled around the dining room table with coffee and tea to go with the donuts. When warm, the donuts were delicious. However, as they cooled, they became a little too crusty for my taste. 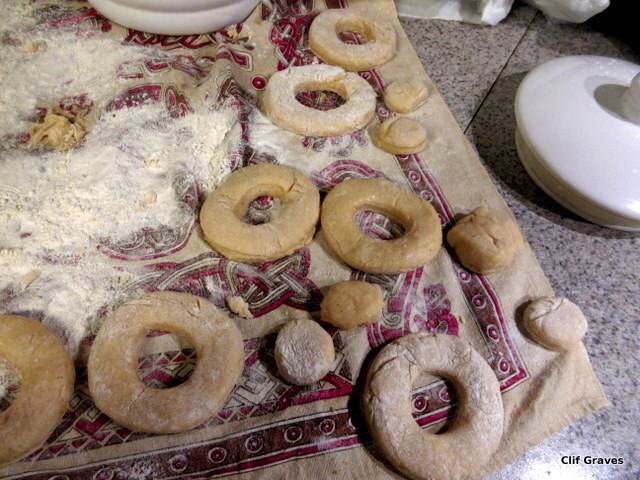 When I mentioned this to Clif, he said that the next time we made donuts, he would not fry them as long. This just goes to show that even with something as seemingly simple as donuts, practice is required to get them just right. Over the next year, we’ll be making half-batches of donuts so that they will come out exactly the way we want. That way, when National Donut Day rolls around in 2017, Clif and I won’t be such a bumbling team. Thanks, Burni! And what fun we had making them. My mother used to make homemade donuts and they were so yummy. The boy scouts have a pumpkin donut booth at the fall festival every year and that is the closest I get to homemade. I stay away from commercial donuts as they are really not even close! 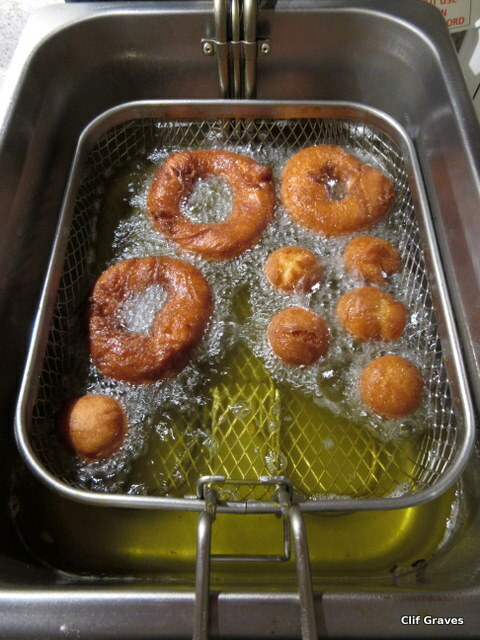 When I think of home made donuts, I think of waking up as a child in the summers smelling them frying in my grandmother’s kitchen. I slept upstairs where there was a register in the floor to let heat rise so along came the smell of donuts. The first day they were amazing, the second day they were a little drier, and after that the only one who could eat them was my grandfather because he dunked them in his coffee. I think lard may have had something to do with it. Great memories though. 🙂 Your chicken salad and your donuts both look delicious. Judy, that’s how it is with homemade donuts. They are best on the first day. What a great idea! 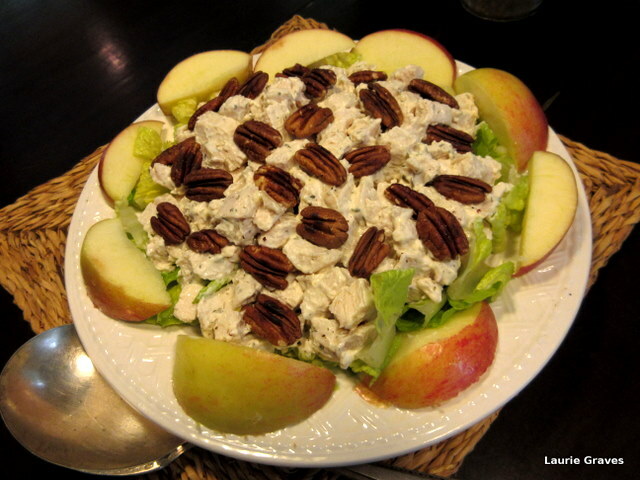 The chicken salad looks delicious and arranged in such an attractive manner. my great aunt Sylvia used to make delicious donuts. Your post brought back many happy memories. How fun! Yes, we all need a friend like Alice with whom we can share our adventures and attempts and not worry. Looks like a lovely time. So true, Carina. Lots of giggles making those donuts. I haven’t made donuts in decades. Of course, we don’t have a deep fat fryer. If we did, we’d be frying all the time! Crusty or not, your donuts look delicious. Well, those donuts look very tasty, so keep warming them up in the microwave or something! That’s a pretty chicken salad too. Donuts, yum. Maybe if you keep practicing you’ll be able to make jelly donuts. Oh my, your food posts always make me hungry….